In Munich last week, I attended a conference on the Andaman Islands. The other participants included academics and activists, Europeans as well as Indians. There were, of course, no Andamanese present. It would be unthinkable these days to have a conference in Australia or North America about issues that concern aborigines, without including aborigines as participants. But the organizers of the meeting in Munich can hardly be blamed: everybody knows that there are no Jarawa anthropologists or Onge activists, that there are fewer Andamanese than there are Australian aborigines or Native Americans, and that the Indian authorities would not allow them to travel to Germany. So we ended up in a rather old-fashioned colonial ritual of talking about people who are acknowledged to be alive, but for whom self-representation would be unnatural. It was as if the Andamanese have been consigned to a state of political death, or something below the condition of human life: 'bare life' confined to a camp, the philosopher Giorgio Agamben might say. This reflects perfectly the mainstream discourse of ‘what to do about the Andamanese,’ but for that very reason it is (or ought to be) deeply disturbing. Not only should we – i.e., those operating within liberal-nationalist discourses of communities and the state – hope to see a Great Andamanese historian or two at conferences a generation from today, we should expect to see Onge activists at conferences now; we should, likewise, refuse to see the Andamanese as people in an advanced state of extinction, who can do nothing except die continuously. When Indian nationalists at the turn of the century looked at groups like Santals and Gonds, or the so-called ‘tribal people’ of the Indian mainland, they saw an anomaly of race and civilization, i.e., creatures located within anthropology, not history. There was, however, more to the context. From Bankimchandra Chatterjee onwards, the search for universal and positivist markers within Indianness were accompanied, in the same individuals, with an obsessive search for what was distinctive, i.e., different from what was declared to be universal but tacitly understood to be European. These compulsions and desires led to a very particular ideological development, which is not only the invention of the adivasi, but also the location of the adivasi partially within the folk. The possibilities of that location become clear if we look briefly at Benoy Kumar Sarkar, who was the most prominent Indian social scientist in the period between the world wars. Sarkar held out a model of locating the aboriginal within the national that was both right-wing and democratic – more democratic, in fact, than the vaguely leftist paternalism that undergirds Indian policy in the Andamans today. Between 1917 and 1922, he made a concerted attempt to identify an Indian race. His objectives were both descriptive and prescriptive: not only did Indian identity have its roots in the tribe and the folk, it should be embraced as such. Just as pertinently, there was no sharp line between tribe and folk, and it was with this grey area between tribe and folk, between the forest, the village and the small town, that Sarkar became fascinated. Tribes shaded into the folk, and functioned as a soil out of which the modern national community grew. Cultural anthropology became a legitimate and alternative national history. Sarkar thus represents a way of thinking about race that is undoubtedly elitist but also inclusive, determined to look beyond – and below – the colony to find the postcolonial nation. His construction of early India was based on a Romantic conception of wholeness that was itself a rebellion against Orientalist narratives of the Orient. Sarkar understood that the ‘Oriental’ tended to be either all-spirit or all-body. Wholeness – and hence humanity – was the preserve of the European. Here, Sarkar made a direct intervention in the discourse of race. Culture itself became the stuff of bodies, as much as it was the stuff of poetry. The discovery of the unrestrained, uncivilized body became the revival of the 'optimism,' or culture infused with political action, that enables change, politics, history and justice. This conception of culture was affiliated with the anti-liberalism that Andrew Sartori has identified in Bengal after Bankim, but it was neither entirely reactionary nor divorced from liberalism. It was the investment in physicality, among other things, that took Sarkar beyond the urban culture of Brahmo-influenced bhadrata, with its stifling emphasis on restraint, to the rustic world of folk and tribal culture. He developed, firstly, a particular outlook on folk culture: it is necessarily part of the nation, but it is also an externally located asset that must be identified and nationalized. Secondly, Sarkar was very aware of his location within a wider Hindu race that had seen centuries of internal ‘circulation of elites’ (he borrowed the expression from Pareto) and in which the classical ‘Aryan’ elements had constantly been infiltrated and mongrelized by the marginal, aboriginal, and mongrel. Sarkar was happy to embrace the mongrel aspects of his Hindu identity, but it was a jittery happiness: it was secure only as long as the right sort of Hindus were in charge of the boundaries of the community. The ‘right sort,’ however, were not the existing urban elites, but an emerging vanguard that could come from unexpected places, such as the margins of the folk world. Sarkar’s long collaboration with Haridas Palit might be seen in this context. Palit came from a very poor, Namasudra background, which he advertised even as he advertised his rise to respectability as a lawyer, educator and activist. His humble origins on the margins of Bengali society became an asset in the formulation of his subsequent social status: it gave him access to knowledge that the born-respectable did not have. Whereas Sarkar had left provincial Malda for the cosmopolitan world of Calcutta and Leipzig, Palit had remained on this inner frontier of Bengali culture, facilitating what might be called an inward-directed cosmopolitanism. Like many contemporary collectors of folk culture, he cultivated a reputation as a wanderer in places dislocated in time, a man uniquely in touch with the illiterate and the tribal. He introduced Sarkar to his specific interests, such as the Gambhira and Gajan festivals of rural and small-town life; these quickly became Sarkar’s own areas of investigation. By seeing a national ‘soul’ in the folk, Sarkar echoed the German Romantic-nationalist Herder, but with a significant distortion. For Sarkar, diversity was valuable within a unified national project. At the Gambhira, he wrote, the observant ethnologist would find not only peasants and tribal people, but also ordinary Bengalis dressed as ‘Santhals and other aboriginal tribes,’ dancing wildly, their bodies pierced by burning arrowheads. Folk culture thus brought out racial confusion and provocative fusions, which were highly desirable to the native in search of racial wholeness. Sarkar’s was not a search for racial purity; it was, rather, the deliberate searching out of ‘impurities’ as the new substance of race, or a reconstitution of race in the colony. Within Indian academia, Sarkar engaged with P.T. Srinivas Iyenger and C.V. Vaidya on the foundational questions of ethnographic nationalism in India: the reality (or otherwise) of an Aryan race, its origins, and its relationship to non-Aryans. Iyenger was dismissive of the idea of a race with foreign origins, seeing the Arya-Anarya distinction as merely a difference of ‘cult.’ Vaidya, on the other hand, was inclined to celebrate the ‘Aryan invasion’ theory of early India, positing clear ethnic and political lines between Aryan settlers and Dasyu ‘aborigines.’ Sarkar was more receptive to Vaidya than to Iyenger, but he inserted caveats. Race, he felt, develops historically, through the gradual accumulation of ‘impurities’ and the development of political purpose. He agreed that Dasyus were aborigines, distinct from Aryans. But he was not interested in fetishizing Aryans as the exclusive insider-race in India. There were multiple insiders, Aryan and non-Aryan, and he wanted them all as his ancestors. That anthropological diversity was a discovery – or at least the claim – of unexplored nooks and crannies of ancestry and origin, which was exciting to a man invested in a world of exploration. Indeed, the fluidity of ethnic interpenetration was highly desirable to Sarkar, because it reflected the operation of political power – the ebb and flow of armies and peoples – without which India would be reduced to unworldly irrelevance. The compulsively miscegenating, politically alive folk could be mined for the masculinity and militarism the elites desperately wanted, especially if its deepest racial origins were unearthed. We find, here, Sarkar suggesting that the folk constituted not only a racial root, but also an alternative bedrock of the Indian state, and a basis of anti-colonial politics. Whereas the administrators of what Nicholas Dirks has called the ‘ethnographic state’ of British India imagined a menagerie to possess, manage and enjoy, Sarkar was proposing a counter-state of the menagerie, in which primitive rituals demonstrated the repossession of the state by the racialized. The particular racial qualities that Sarkar desired were, however, also dangerous, in need of control and repression. At a time when the Criminal Tribes Acts were still very much in effect, folk militarism was the other side of the delinquency of entire populations. What made the state viable was precisely what the state must manage constantly through punishment and education. Folk festivals function in Sarkar’s narrative as an ancient national education, explicitly described as being both moral and political. Crucially, we find that education has taken on a distinctly democratic appearance: it is not just a top-down process of the urban elite teaching the rabble, but of the rabble teaching themselves, and even teaching the elites a lesson or two about town planning, sanitation and governance. The knowledge of modern civic life is thus democratized and diffused throughout the body politic, and democracy was nothing less than the secret history of the folk. The idea of the democratic nature of tribal society was not new, but Sarkar brought it to bear on the wider community of Indians through the mechanism of the folk. Folk festivals revealed the existence of submerged indigenous elites in the villages of 24 Parganas, and even Taliganj, he wrote. The most authentic Indians could thus be found right on the edge of the colonial metropolis. Describing the worship of Mangala-Chandi in this proximal margin of colonial civilization, Sarkar insisted that this folk goddess was in fact the guardian angel of every Bengali home. He was suggesting that folk traditions serve as multiple bridges, connecting the bhadralok world with the world of peasants, the world of peasants with that of tribal people, the culture of the present with the distant past. This connectedness fleshed out the nation, reducing the gap between those who value culture and those who constitute culture. Just as importantly, it established the private interior of the home, as opposed to the public altar of the temple, as the secret location of folk tradition: at heart, therefore, the bhadralok are also part of the folk. Indians were, among other things, an emerging tribe. Sarkar was not saying that Indian folk rituals constituted modern statecraft, or that villagers were the ‘real’ modern Indians. Rustics in a particular imaginary mode were like modern citizens, or useful shadows of the modern citizen. As a tongue-in-cheek reference to the Welsh as the mlechcha of England indicates, Sarkar knew he was dealing in ascribed identities and utilities. But just as the European folk could function as a bedrock and a foreshadow of European modernity, the Indian folk was a thrilling vision of the modern in the primitive and the primitive in the modern, akin to seeing a ghost. As in any Romantic project of recovering the folk, that ghostly element was reinforced by an anxiety – both sharp and decadent – that the folk were dying out, destroyed inexorably by a vulgar modernity that could not be disavowed. But the very awareness of that death could be racially invigorating. Sarkar quoted the poet Baradacharan Mitra as saying that ‘We should, all of us, do our best to see that ancient festivities of Bengal like those of the Gambhira do not die out.’ It was by becoming aware of racial loss that modern Indians could realize their race as a new political truth. We thus have in Sarkar the construction of an indigeneity that is simultaneously internal and external to the national self. And this is a very basic aspect of the adivasi as a paradigm of indigeneity. It is not quite the Self, it is dangerous, it is subject to morbid anxieties, but it is also intimate and admissible. For the non-adivasi, it promises a receptable – temporal, spatial and racial – for that part of the modern self which is at odds with the generic, mundane, liberal framework of the democratic state. It holds a part of the self in abeyance, as it were, from a subjecthood with roots in colonialism. And that is precisely why it is democratic: it permits, in theory and to some extent in practice, a two-way movement, between modern citizenship and aboriginality. So Jaipal Singh – hockey star as well as adivasi activist – could pose with either a hockey stick or a spear, and Sarkar could be either a sociologist armed with numbers and charts, or a Romantic receding into the fog of ‘exotic’ folk traditions. Even during the debates of the 1950s surrounding Verrier Elwin and tribal policy, it was understood that tribals represented a primitive Indianness. So we can talk about adivasis being exploited and their lands being stolen, just as we can talk about peasants being exploited and their lands being stolen, but we cannot reasonably talk about adivasis and their land being colonized, because that word brings with it assumptions about race, political community and membership that do not apply. Indeed, the concept of the adivasi is a rather elegant resolution of modern India’s problem with the primitive. It is an updating, rather than a total replacement, of older, extra-colonial notions of the porous boundary between wilderness and civilization. Within this resolution, extreme forms of violence and exploitation have persisted, but that is partly because the boundary has been poorly managed by the state. That framework, however, falls apart when we look at the Andamans, because it becomes clear, here, that not all aborigines are adivasis. 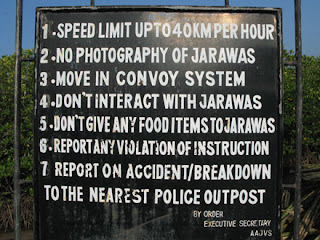 It is useful to go over what is different in the Andamans, at the risk of stating the obvious. Firstly, the Andamans are both literally and metaphorically islands in the mainland Indian imagination: belonging to the nation, but cut off from the nation. Secondly, that dislocation has been most acute when it comes to the Andamanese, who entered Indian discourse very differently than did the tribals of the mainland. Santals and Mundas did not have to wait for the British in order to become known to Indians, or even to be known as Indians. H.H. Risley and company had no monopoly on the processes of knowing. The Andamanese, on the other hand, came to India largely through British mediation. Under the circumstances, the Andamanese that Indians conceived remained fundamentally alien: accidental discoveries, as it were, unsupported by indigenous discourses of familiarity and kinship. They entered India not as the semi-open category of the adivasi, admissible into folk and nation, but as the fully closed category of the adeem janajati, too fragile for contact with the world beyond the reservation. It is not surprising, therefore, that the Indian-national encounter with the Andamanese has been colonial, and on at least four interconnected levels. At one is the straightforward business of expropriation: the various kinds of crowding out, hemming in, and encroachment, enabled and justified by the total displacement of one set of ideas about land, space and ownership by another. At another is a museological-zoological outlook: tourism operators getting Jarawas to dance, but also, at the level of the intelligentsia, relegating the Andamanese to the status of museum objects and a species that might become extinct. We do not use the rhetoric of extinction with the Santals or the Welsh, no matter what the circumstances. The third is the issue of ethnocide. The fourth is political exclusion, which enables all of the others. What links these various predicaments together is a question of coming and going, which is familiar to us from the adivasi debates of the 1950s. At the heart of what Elwin and others debated were the questions: can non-adivasis ‘go to’ advisasis, and can adivasis ‘come to’ the nation-state? Because adivasis are unquestionably Indians, both these questions were ultimately answered in the affirmative, although obviously coming and going were not going to be on equal terms. But adeem janajati are not unquestionably Indians, and the imbalance of coming and going in the Andamans has corresponded to this exclusion. Outsiders can go to the Andamans: the very existence of the place is an invitation to colonization. But more pertinently, the Andamanese cannot come out, literally and metaphorically. 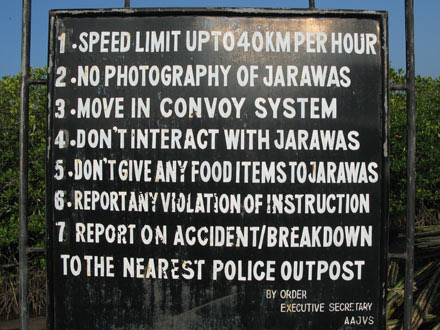 Not only can the Jarawa and Onge not leave the tribal reserved without quickly being escorted back, they cannot leave an ethological-administrative category that admits of no change, movement or agency. Why can’t they come out? Why can’t they want to cross what has become a kalapani in reverse: a forbidden expanse of water and jungle, but even more than that, an expanse of race? It is worth remembering that Tasmanian aborigines – not long ago regarded as an ‘extinct race’ and close cousins of the Andamanese – have since ‘come out’ of extinction, not by Jurassic Park style cloning or a sudden outbreak of fecundity, but by a radical alteration of the concept of aboriginality that did away with the insistence on racial and cultural purity, and placed control over the boundaries of aboriginality in the hands of the aborigines themselves. It is possible, now, for the Australian cricketer Jason Gillespie to be an aborigine without having to prove his purity or ‘looking’ a certain way. 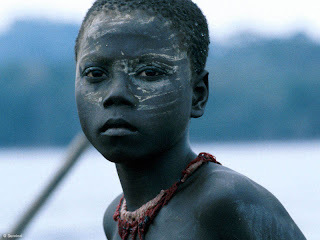 Likewise, it should be possible now for an Onge or Jarawa to travel to Munich and talk to scholars and activists about what they want, to marry a German anthropologist or a Turkish cabbie or a Tamil journalist, and have children who are still Onge or Jarawa if that is what they choose to call themselves. They need not become activists; they are already activists, because their everyday relations with people on the margins of the reservation – settlers, policemen, poachers, Adeem Janajati Vikas Samiti workers, anthropologists – are, and have long been, marked by resistance, negotiation and political agendas. They are not ‘innocents,’ and to treat them as permanent innocents is the worst kind of mismanagement, not least because it puts them in a situation reminiscent of the lions in Gir Forest: an enclosed population, that can be wiped out by a few HIV-positive policemen or truck drivers on the Andaman Trunk Road. This is where we come to the issue of ethnocide. We should be extremely careful about using terms like ethnocide when it comes to the Andamans. When we do that, we make a fetish of race that inevitably produces ethnicity as a fossil, and makes being Andamanese inseparable from the condition of the dying primitive. It’s not all that far removed from the imperial decadence of wringing one’s hands at the inevitable death of the savage. Obviously, it is too late now to ‘not go’ to the Andamans. That boat has sailed; the idea of total isolation is a fantasy. But it not too late to react prosaically, realistically, to the impact of the boat people, which means making it easier for the Andamanese to come out, instead of focusing on sealing them off from the outside and seeing contact and change as racial death. I do not pretend to know how this should be done, although basic steps like access to education, information, voting rights, health care, the courts and the media would have to be at the core of any program. But we should begin by accepting that the Andamanese are not more special, or subject to extinction, than Bengalis, the Welsh or Tasmanians. They would then at least have a chance to reformulate their ethnicity and their political relationship with others. They might no longer be Jarawas or Onges, and that might be a loss. But it is more damaging, and more colonial, to think of it as our loss.